The alarming growth in the incidents of atrocities, violence, suppression and discrimination in all areas of life against the Dalits, and Tribals/ Adivasis, especially in the field of education which is hindering their progress. The growing tendency of fundamentalist groups, in the present Indian political scenario, to assault democracy and the right to live, and the negligence of the government administration in not implementing the Constitutional Rights, Acts and UN International Declarations given to the Tribals/Adivasis. The development policies of the government, which are expressive of the vested interest of the dominant caste and class forces that further the victimization of the vulnerable communities in the country. The prevalence of caste based discrimination and practices of untouchability in spite of Article 17 of the Indian constitution. 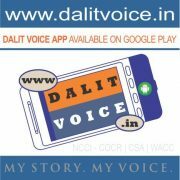 The discrimination against women, children, and sexual minorities among the Dalit/ Tribal/ Adivasi Communities who are the most vulnerable because of their caste, race, sexuality and gender. The forces that undermine the complex nature of caste, race, sexuality and gender. Developmental projects and enforcement of law at the cost of Dalit, Tribal/Adivasi identity and livelihood. 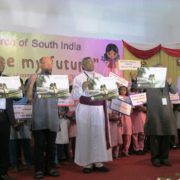 The churches in India not seriously considering the prevalence of casteism in the church and society. The non-efficacy of Article 21 in the Church and Society. The Church should make further efforts in engaging casteism by adapting and strengthening the campaign “No one can serve Christ and caste” put forward by NCCI. The Church should be sensitised about the socio- political scenario, and should be willing to learn and use constitutional rights for the betterment of the lives of these Communities. Churches should be re-oriented to be effective instruments in their prophetic vocation towards sustaining just and inclusive communities. The uniqueness of the culture, philosophy, ethics and values of the Tribal and Adivasi communities which can contribute to the journey towards just and inclusive communities. 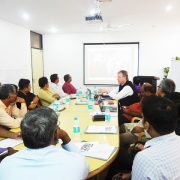 The rights of these Communities to equal opportunities and resources in India. The sanctity of the Indian Constitution and the freedom, equality, justice and fraternity it propagates. The need of gender equality among these Communities, also in the church and society. The rights of Dalit Christians should be the priority of the entire Christian community in India and not of Indian Dalit Christians alone. 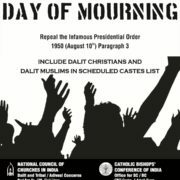 The Church should continue to observe special Sundays like Dalit Liberation Sunday and Tribal and Adivasi Sunday, and should ask the congregations to share their resources to establish an NCCI corpus fund for Scholarships for Dalit and Tribal / Adivasi students. The Church should more actively advocate the Rights-based approach for justice, equality and peace. The church should work as a redressal mechanism. The Laws made for safe- guarding these communities should be enforced by strengthening and widening the “No one can serve caste and Christ” campaign and the discrimination and exclusion in Christian institutions should be confronted. The Church should take up the responsibility to sensitize the communities on the governmental Sub- plan for economic empowerment. The Church should have a provision to provide legal support to the communities which are prone to violence and atrocities. The Church should empower the communities to be self-sustaining and initiate dialogue between and among churches to be just & inclusive. The Church should network, partner and work together with likeminded organisations and fellow churches in tackling casteism/racism. 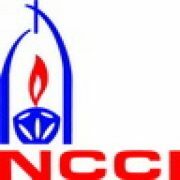 The member churches of NCCI should continue to demand from the government Christians of Dalit origin should be included in the Scheduled Castes list. The Church must at this time in history feel challenged to give every support possible to all the Christian communication bodies, both national and international, engaging in prophetic ministry in the midst of injustices in the society. The churches should continue to offer career guidance courses and leadership training camps for the dalit, tribal/adivasi students in order to reduce exclusions in the field of education, aiming at zero discrimination. The churches should re-read their histories, doctrinal traditions and mission practices, thereby looking ahead with an integral approach for addressing issues of caste and untouchability. Presented on behalf of all the delegates gathered for the Consultation.